This essay treats education biographically and uses special education as a way of discussing how education generally defines itself. While education can be variously defined, this essay is less concerned with definitions of education and more interested in how education, through its various classificatory schemes, defines itself. In an essay that treats the school as trickster, Adrea Lawrence discusses the plasticity of education and the ways that Native American schooling made schools themselves into shape shifters, into contradictory spaces that morphed in relation to the Americanized subjects they desired. “General” education is similarly contradictory and likewise shifts and morphs through the use of classificatory schemes. Though scientific in description, special education classifications have a beginning and change over time and thus mark the life history or biography of education. Although biographies are traditionally of people, perhaps also of places, things, or ideas, the biographical approach can also be applied to social institutions. In employing biography as a method of inquiring, this essay argues that education’s life history is related to how special education classifies the subjects of education. This biography suggests that special education is not something that “general” education does but is what education generally is. To be sure, this methodology reifies education as a persona that acts on its own rather than as something that is enacted by students, teachers, administrators, or policymakers. The language of education defining itself is used here to draw attention to this reification and the ways that classificatory schemes do more than define the subjects of education as this or that label. Classificatory schemes also give education itself coherence as a subject. This methodological implication is important given education’s desire for a theory of special education. The special classes in the public schools of the city of New York had their beginning in Public School 1, Manhattan, in 1899. It is interesting to know that this class, which was to demonstrate the need for further classification of children in public schools, was not the result of any theory. It grew out of conditions in a neighborhood which furnished many and serious problems in truancy and discipline. This first class was made up of the odds and ends of a large school. Farrell’s insistence that while New York City’s special classes were “not the result of any theory,” they would nonetheless demonstrate “the need for further classification of children” involves a circular logic common to Progressive Era special education, a logic which insisted that the science of classification only empirically validated the biological traits of those being classified and was thus “not the result of any theory.” This logic makes Progressive Era special education appear as though it emerged fully formed despite needing constant self-definition. Figure 1. Three ways of understanding the relationship between special and “general” education. Figure by author. Graphic by Sara Clark. The ways in which education defines itself through classificatory schemes is evident, for example, in the replacement of the classification of idiocy by feeble-mindedness and the gradation of this latter classification into low, medium, and high grades, each of which corresponded with a limit of intelligence and a plateau of cognitive development. As Image 3 of Figure 1 above illustrates, these limits and plateaus produce categorical spaces within education that work to define education generally. These spaces are categorical both because they rely on classifications (categories) of human difference and because, despite their allure of impermanence, they absolutely segregate students according to indeterminately defined differences. Gradations, of course, require a way of determining which bodies belong to which grades, which introduces the problems of definitional fluidity and borderlinity. In an effort to resolve these problems, experts established determinations predicated on mental age, a concept newly derived from the cultural epoch conclusions of child studiers like G. Stanley Hall who argued that, despite being adult in appearance, those “savage” populations encountered through Western colonialism were, in fact, cognitively childlike. This conclusion provided the intellectual undergirding for the science of classification, which sought to make visible through the technology of intelligence testing that which appearance might conceal; that is, experts who advanced the science of classification were concerned with the possibility that individuals with retarded cognitive faculties might pass as normal and thus put the general population at risk of diminished prosperity. It thus became increasingly important to identify which bodies were feeble-minded and to define the categorical spaces of normality and abnormality within education. Such efforts were, of course, illusory, as definitional fluidity and borderlinity are necessary requirements of any classificatory scheme. As each produces the necessary conditions for classification to exist as a science, and each ensures that the shortcomings of any particular classification do not undermine the science itself, but instead only warrant the need for greater scientific accuracy. A difficulty with this warrant is that more science becomes the only way of redressing bad science, a circular logic that easily allows for previous classifications to be forgotten once they have been replaced by newer, more accurate ones. Contra this tendency, this essay seeks to remember the classificatory schemes of Progressive Era special education as illustrative of how in working to define the categorical spaces of normality and abnormality education itself becomes generally defined. What is forgotten in this essay’s act of remembrance, then, is the incrementalism of scientific discovery, which because it always already presupposes revisionism can hide how and why classificatory schemes are defended and revised. Also assumed by this process is insularity; that is, scientific discoveries have no influence outside their own epistemic borders. Hence, for example, Henry H. Goddard’s discovery of the moron in 1910 can be understood as a purely scientific discovery that incrementally improved upon the previous discovery of Alfred Binet. Denied by such reasoning is the fact that the moron classification did just define particular subjectivities but also education generally. This was because education was both a location for identifying morons and a procedure qua training for treating moronity. This essay asks that this view of incremental scientific discovery be forgotten and that the contingency of classificatory schemes be remembered instead as a way of imagining an education that is different from the one these schemes readily provide. Definitional fluidity and borderlinity enabled the science of classification to remain operative throughout the Progressive Era and suggests a lesson about the educational use value of indeterminacy, a lesson that is not about the accuracy of this or that classification but about education’s need to classify difference as a way to define itself. The Progressive Era study of feeble-mindedness, then, was not only about defining educational subjectivities but also about establishing categorical spaces within education designed for bodies determined, for whatever reason, to be abnormal. Understood as a process of constant self-definition, the history of Progressive Era special education emerges as a way of thinking about education generally rather than only about the history of a specialized field. This understanding follows James Trent’s history of feeble-mindedness but also suggests that the desire to order difference was a necessary requirement of education’s self-definition. The categorical spaces of Progressive Era special education emerged from the purposively indeterminate spaces of intermediate and ungraded classes, spaces that allowed for easy ingress and whose allure was the promise of eventual egress. The movement of students within these spaces suggests that classificatory schemes were the producers, not the result, of a progressive educational order of things. The history of Progressive Era special education is thus a history of an attempt to clarify difference through classificatory schemes designed to determine the allowed proximal distance of special to “general” education. The parameters of this distance would be discussed and debated within the pages of scientific journals like the Journal of Psycho-Asthenics and point to attempts to validate the emerging field of special education. The science of classification qualified this emerging field and its experts as uniquely capable of interpreting human difference and was the expertise that Farrell sought in her request for a theory of special education. This two-part conceptual inquiry into the theory of Progressive Era special education proceeds from two perspectives. Part 1 takes up the classification of the laggard and the question of definitional fluidity, as well as education’s administrative tendency toward managing difference out of education. Part 2 discusses the classification of the moron and the question of borderlinity, as well as education’s tendency toward identifying difference within education. The laggard, like the dullard, was a classification that described students who did not advance at the pace established by the modern progressive educational system or who might have fallen back from earlier advancement. The laggard was especially important to Leonard Ayres’ study of educational efficiency, in which he sought to quantify the numbers of students who were advancing through or dropping out of education. The laggard reflects an administrative tendency within education concerned with students exiting the formal education system. Ayres’ study statistically agreed with Farrell’s clarification that students were being placed in special classes without a theory and sought to counter such “opinion, guess work, and eloquence.” Ayres’ statistical evidence bore out schools with low rates of promotion and high rates of retardation and yet Ayres insisted that retardation “expresse[d] a condition, not a process or explanation,” and was simply a way of referring to students whose advancement was slower than average. This classification quickly became part of what Joseph Tropea describes as the “backstage social order” of Progressive Era special education, which required “actors’ tacit understandings and interpretations of their organizational situations” as well as the “learning of backstage roles, rules, and definitions.” This backstage social order helped educational leaders deal with the recurrent problem of lagging students through transforming both the organization and rhetoric of education. Educational leaders thus managed students into special classes where they did not count toward general retardation rates. In addition to this administrative tactic, schools also issued work permits that allowed students to be released from compulsory school attendance. Thus, despite Ayres’ insistence on the neutrality of the laggard, the condition of retardation still presented an administrative concern that lagging students would drain educational coffers and that their slow advancement would retard the educational progress of all students. This administrative concern has organized special education since it emerged concomitantly with the ideal of a common school system. Boston public schools, for example, were from their beginning organized around “separate instructional settings for certain children whose public school attendance was deemed desirable but whose presence in regular classrooms, for a variety of reasons, was not.” While intermediate and ungraded classes cast doubt about the commonness the common school movement, Roberts v. Boston (1850) had already established legal precedent for not only excluding black children from public education but for also engendering a separate and unequal logic that continues to order special education. The tension between increased school attendance and the concern that not all children were suited for general education led the Boston School Committee to create intermediate schools with the hope that special instruction might enable lagging students to rejoin their common peers. The tension between intermediate and ungraded classes being spaces of indefinite detention and spaces that would indefinitely collect miscellaneous students would not be resolved by Progressive Era special education. This did not prevent experts like J. E. Wallace Wallin from attempting to resolve this tension through clarifying special education’s classificatory schemes. Noting that “the word special is generic and applies to eight or ten different kinds of special classes,” Wallin argued that special classes should be reserved for “imbeciles, morons, borderline and seriously backward cases,” and that the term ungraded classes “should be applied to classes in which children who are retarded in one or more branches are given individual attention.” Despite Wallin’s attempt to cohere the definition of special education, its spaces remained porous, evident in Wallin’s introduction of a third type of class, “the elementary industrial class,” which was designed for young adolescents who “are appreciably backward or who are over age because of inability to cope with regular curriculum, and who withal are industrially inclined.” That it was possible for students to be placed in these classes for reasons known only to experts like Wallin suggests how definitional fluidity creates categorical spaces. Indeed, with the discovery of the moron, experts would increasingly rely on this use value of indeterminacy as well as their ability to accurately interpret the borderlands and borderlines of feeble-mindedness to validate their expertise. The laggard testifies to how difference challenged the vision of a common school system, a system which might be better understood as an administrative belief that while all children should be included in general education, purposively indeterminate spaces for certain “special” children were required. Managing students into the categorical spaces of special education was not the only way Progressive Era special education relied on definitional fluidity. While the laggard could be readily identified by slow progression through schooling, the moron was identified against their ability to pass as normal and reflects an educational tendency toward identifying students within education. Relying on a mental age of twelve as a determinacy of high grade functionality, Goddard asserted his discovery of a previously absent classification of feeble-mindedness. The moron became a standard gradation for educational subjectivities that appeared normal, but who were determined, for whatever reason, to be abnormal and, like the laggard, testify to education’s reliance of the science of classification as a method of self-definition. Goddard’s discovery also challenged the limits of education’s administrative tendency as falling out of education became an insufficient condition for defining education. No longer would the general classification of feeble-mindedness be sufficient; instead, the classification of the moron signals a desire to identify specific subjectivities within education. In addition to reflecting definitional fluidity, the discovery of the moron came to reflect education’s difficulty with borderlinity, which while similar to the omnium gatherum settings of the common school movement, did not so much rely on students aging out of education as being more accurately identified within education. While the moron was ultimately determined to be an inaccurate classification, it still teaches an important lesson about education’s self-definition. Goddard’s discovery was made possible by a perceived lack of classificatory accuracy, from a borderland or borderline within the general classification of feeble-mindedness. Benjamin Kelsey Kearl is a Philosophy of Education doctoral candidate in the School of Education at Indiana University. Benjamin is currently an Associate Instructor and Future Faculty Teaching Fellow in the College of Education and Public Policy at Indiana University-Purdue University, Fort Wayne. He can be reached at bkearl@indiana.edu. The author would like to thank Adrea Lawrence and Sara Clark for their helpful and insightful edits and suggestions. Robert Osgood of St. Norbert College and Donald Warren of Indiana University served as peer reviewers for this essay. Education’s Histories is grateful for their careful attention to and thoughtful feedback. Part 1 of this essay discussed the laggard, an educational subjectivity used to denote students who did not progress through schooling at the pace determined by the modern progressive educational system. Important to the story of the laggard was how definitional fluidity allowed the science of classification to indefinitely collect and detain lagging students until the age of twelve when they could fall out of education. The story of the moron relies on a similar use value of indeterminacy, which is why its discovery in 1910 by Henry H. Goddard did not disprove the science of classification, but only the inaccuracy of a previous classificatory scheme. Similarly, in discrediting the moron, Lewis Terman of Stanford University would not argue against classification as such, but only for the inability of this particular classification to accurately measure intelligence. This part of the essay takes up the classification of the moron and the question of borderlinity as well as education’s tendency toward identifying difference within education. What, then, do borderlands and borderlines reveal about how education defines itself? Goddard, who also directed the Vineland Training School, discovered the moron by standardizing the Binet intelligence test to include the concept of mental age. This standardization remained prominent until Terman’s revision of the test. The Stanford-Binet revision claimed differentiation from Goddard’s own revision of Binet’s test on the grounds that it was more scientifically accurate. 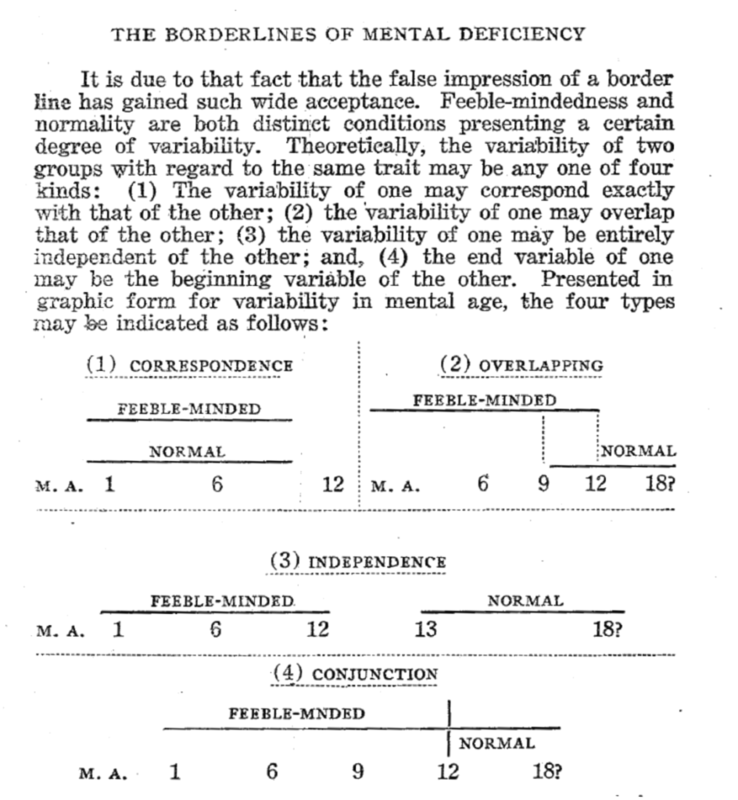 Specifically, Terman, along with fellow Stanford psychologist H. E. Knollin, argued that Goddard’s classificatory scheme was problematic because adults and those with a mental age of twelve or higher tested as morons despite being located along the borderline of “average adult.” The specific problem with Goddard’s scheme was that it resulted in a three year disparity between mental and chronological age, which Terman and Knollin corrected for by extending the age level being measured from twelve to fourteen and measuring intelligence as a ratio between median chronological and median mental age. Under Goddard’s standardization of the Binet intelligence test mental age was understood only in terms of chronological age, thus, the problem of age disparity observed by Terman and Knollin. This error was exponential as a difference of ten months at age five, which became twenty months at age ten and two and half years and age fifteen. Terman and Knollin’s corrected for this error by revising the Binet test so that median chronological age corresponded with median intelligence (mental age). This revision introduced the classification of the average adult, where for Goddard adult was an absolute demarcation of both chronological and mental age. Greater accuracy, however, did not result in the reclassification of individuals previously identified as morons. As discussed in Part 1, more accurate classifications do not result in individuals falling out of categories due to the belief that those being measured essentially possess the quality being measured. This belief was tested when enlisted men were given the Alpha and Beta intelligence tests in 1917. Comparing these test results with Goddard’s revision of the Binet intelligence test revealed that more than forty percent of enlisted men were morons. Goddard defended his classification against this result by arguing that moronity only applied to individuals who were already obviously feeble-minded beyond other mental or physical signs and by insisting that because enlisted men could manage their own affairs, they were not feeble-minded which meant that definitionally they could not be morons. This defense relied upon a similar circular logic as introduced in Part 1 by Miss E. E. Farrell, Inspector of Ungraded Classes of New York City. For Goddard to prove the inexactness of the application of his classification, he had to rely on the exactness of the classificatory scheme of feeble-mindedness, an argument that belied his insistence for more classificatory accuracy within the general scheme of feeble-mindedness. This circular logic, common to Progressive Era special education, is also evident in Goddard’s insistence that the feeble-mindedness of immigrants could be identified upon sight. It was as if the classification of the moron was proceeding without any theory and was being capriciously applied to individuals determined, for whatever reason, to be abnormal. While this capriciousness should not be ignored, neither should it detract from how the moron can help education better understand how it defines itself. Indeed, how and why classificatory schemes are defended and revised is as important as the schemes themselves. Thus, although Farrell insisted that New York City public schools were proceeding with special education without a theory, perhaps the theory she was looking for, and what special education continues to seek, was there all along; that is, a theory to generally explain human difference within education. Farrell’s clarification, which began Part 1 of this essay, might be better understood, then, as an attempt to justify an emerging specialized field of education uniquely qualified to deal with the “many and serious problems in truancy and discipline” present in the neighborhood surrounding New York City’s Public School 1. Intelligence was thus a matter of correct social adaptation and the exhibition of appropriate social responsibility beyond other mental or physical signs, a distinction Goddard utilized to hypothesize that because there were grades of responsibility and intelligence, responsibility varied according to intelligence. Intelligence was thus not fixed, but something that was socially variable and which was called into question by the modern progressive education system. Goddard’s hypothesis followed Alfred Binet’s observations that French peasants do not possess, nor need they possess, the same intelligence as Frenchmen living in Paris. Goddard would argue, however, that the relativity of intelligence was preventing child studiers from seeing the real issue at stake: “[T]he persons who constitute our social problems are of a type that in the past and under simpler environments have seemed responsible and able to function normally;” however, Goddard continued, due to increased social complexity, such persons “are no longer responsible for their actions.” Whereas previously the moron might have been able to hide in rural settings, modernity presented unique challenges of adaptation and responsibility that required a science of classification. Among the new challenges modernity presented to individuals was industrialization, but its processes of production also provided the means by which adaptability could be measured (Fig. 2). Statistics, already used by Ayers to argue for administrative efficiency, warned of an increase in feeble-mindedness within the population based on an increase in the number of individuals being trained by institutions for the feeble-minded. With this looming threat in mind, Goddard called for a method that divided the population first according to a baseline of intelligence above which there was a second line demarcating persons with sufficient intelligence to function in simple environments from persons capable of functioning in more complex environments. Below this baseline were persons unable to function in any environment. The causal relation between responsibility and intelligence provided Goddard with a rubric for treatment: “Knowing the grade of intelligence we may know the degree of responsibility. Knowing the degree of responsibility we know how to treat.” This rubric was important because morons were “often normal looking with few or no obvious stigma or degeneration [and] frequently able to talk fluently.” Goddard’s insistence on the inability of morons to function normally despite being able to pass as such meant that moronity would have to be prevented eugenically rather than ameliorated educationally because, following Goddard’s application of Mendelian genetics, “one can never be sure that the feebleminded taint is not recessive and only waiting for a proper mating to appear.” Moronity was a genetic and hereditary threat to the population and its prosperity, capable of producing what disability theorists Sharon Snyder and David Mitchell describe as a “subnormal nation.” This was why identifying morons as well as demarcating the borderlands and borderlines of moronity became so important. Goddard’s discovery of the moron allowed experts to determine what tasks children of different mental ages should be expected to perform, but also introduced the problem of borderlinity; that is, of determining whether a child was sufficiently performing those tasks deemed appropriate to their mental age (Fig. 2). But Goddard’s discovery also opened up the science of classification to the possibility that it was inexact and in need of revision. Prior to Goddard’s discovery, the etiology of human difference could be understood through binary classifications, normal/idiot and then normal/feeble-minded, under which all human variations could be explained. Thus, for example, conditions as different as blindness, deafness, epilepsy, syphilis, and cretinism had the same nosography despite presenting differently. This was because visible human differences were only symptomatic expressions of a common feeble-mindedness; inversely, feeble-minded diagnoses led experts to isolate physical abnormalities to empirically evidence their diagnoses. The moron, a special type of feeble-mindedness, was a classification of human difference that proved the human sciences (in this instance, psychology) could discover differences within human variability that had gone previously unnoticed, use science to identify which variations were productive or degenerative, and order institutions according to this baseline distinction. Figure 2. 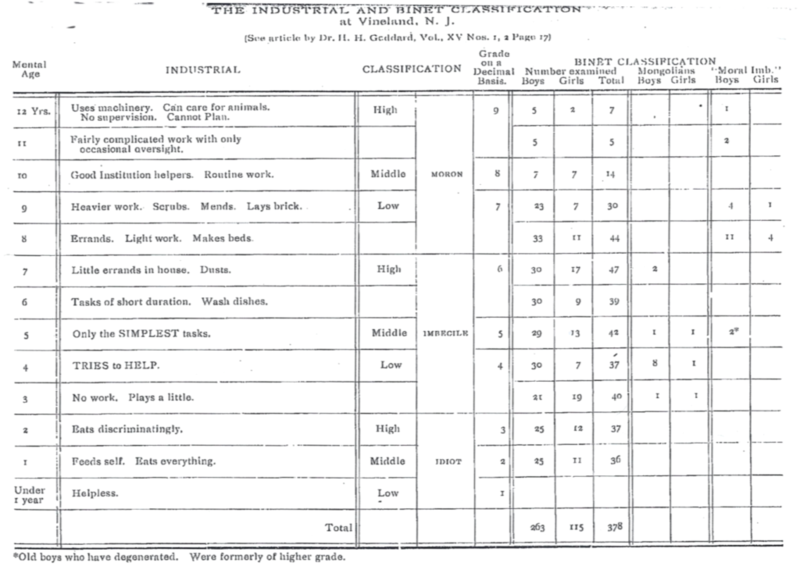 The industrial and Binet classifications at Vineland, NJ. Taken from Henry H. Goddard, “Four Hundred Feeble-Minded Children Classified by the Binet Method,” Journal of Psycho-Asthenics, 15, no. 1 (1910): 31. Although there are few explicit references to borderlines or borderlands in Progressive Era scientific journals such as the Journal of Psycho-Asthenics, borderlinity nonetheless permeated the Era’s discussions of feeble-mindedness. In taking up the concept of borderlinity, this essay attends to how experts explicitly discussed the borders of feeble-mindedness and argues that in attempting to draw borders around and within feeble-mindedness, experts were at once reasoning the population into classifications and populating the categorical spaces that resulted from these reasoned classifications with subjectivities that were defined in enough abstractable detail so as to remain indeterminate. It would be easy to discount the moron as bad science if it were not for the fact that the inexactness of previous classifications, like the moron, continues to haunt special education. As used in this essay, the concept of borderlinity as well as term borderlands refers to the space of overlap between normality and abnormality. Borderland cases surfaced when individuals might be classified as either normal or abnormal depending on the evaluative measure employed. Discerning this space was the exclusive purview of experts who worked to varying degrees and sometimes in contradictory directions to define the borderlinity of feeble-mindedness. The case studies which defined the borderlinity of feeble-mindedness were, in turn, used to populate the borderlands of feeble-mindedness. Case studies thus represent not only evidence of borderlands, they also indeterminately defined the subjectivities that gave these categorical spaces meaning and purpose. The borderlands of feeble- mindedness, however well conceptualized, could not exist unless populated. This essay acknowledges several similarities with the method of borderlands history. Like geographic borderlands, the borderlands of feeble-mindedness were also constructed from removed, specialized locals (i.e., training institutions). Both the borderlands discussed here and those that appear on maps reify the sovereign power of experts to draw lines of inclusion and exclusion that accordingly determine allowed degrees of proximity and allowable movements of ingress and egress. In acknowledging borderlands history, this essay also acknowledges a critical investment in understanding borderlands as having active and contested histories rather than as being passive and transcendental demarcations of separation. Thus, it is not the nation-state as already geographically defined, but the recurrent use of borderlands as spatial and temporal means of national self-definition that interests the borderlands historian. This method gains import for education historians and policymakers due to the propensity of geographic borderlands and those of feeble-mindedness to be mutually reinforcing. Hence, for example, the disproportionate placement of English Language Learners in special education, a present condition of exclusion that finds its historical antecedent in the common school movement’s treatment of immigrants. Figure 3. Four types of variability between feeble-mindedness and normality with regard to mental age (M. A.). Taken from Samuel C. Kohs, “The Borderlines of Mental Deficiency,” Journal of Psycho-Asthenics 20, nos. 3-4 (1916): 95. In addition to specifying which tasks corresponded with what metal age, questions of borderlinity also involved mental age itself; that is, whether the metal age of twelve was a borderline separating normality and feeble-mindedness or the upper limit of a borderland of feeble-mindedness. Looking at Figure 3, the reality of an overlapping borderland of feeble-mindedness can be compared with the idealism of correspondence and independence and the error of conjunction. Discussions of borderlinity positioned conjunctional designations of feeble-mindedness, rather than the classification itself, as arbitrary because there was not “a specific mental age, or a definite intelligence quotient, or a particular mental coefficient or a specified per cent. sic as the point at which normality ends and feeble-mindedness begins.” As progressive as this indeterminability may sound, the relaxing of feeble-minded designations precipitated by Goddard’s discovery of the moron and its subsequent revision by Terman did not lessen the imposition of classificatory schemes, but only increased the demand to populate the borderlands being created by these schemes with indeterminately defined subjectivities. Efforts to populate the borderlands of abnormality were well under way prior to Goddard’s discovery of the moron. A. C. Rodgers, for example, identified backward children, temperamentally abnormal children, the juvenile insane, and moral imbeciles as “borderland cases,” an ad hoc designation intended to be “comprehensive enough and to include all those cases of abnormal children which do not properly classify with the typical feeble-minded,” but which should still be viewed from “the standpoint of an institution for the feeble-minded.” Rodgers was concerned with how the four borderland cases he identified would interact with training institutions. The backward child was most receptive to training and the moral imbecile was too governed by “selfish desire” to be receptive and thus should be the purview of the courts. Rodgers’ identification of borderland cases is not unique, nor was it uncommon for experts to describe subjectivities as ranging from receptive to incorrigible. Rodgers’ borderland cases are also not particularly interesting in and of themselves except for the fact that, like the moron, which was simply as a feeble-minded person with a mental age between 8-12, they too were empty enough of meaning so as to be made meaningful by experts. What should be of interest to both education historians and policymakers is how indeterminate definitions produce categorical spaces that education leaders and experts must then populate. The populating of education’s categorical spaces is evident in the numerous case studies that fill the pages of the Journal of Psycho-Asthenics, studies which were ostensibly meant to prove the accuracy of this or that classification, but which materially extended into the world of education where they became placements, empirical pronouncements to justify why particular bodies inhabit particular spaces. Definitional fluidity thus produced categorical spaces that must be populated if the definitions that justified the existence of these spaces were to remain meaningful. Definitional fluidity worked in the other direction as well: Once populated with bodies, education’s categorical spaces produced definitions of human difference reflective of those particular bodies. While there was a risk that this circular process would result in misclassifying the normal as feeble-minded, this risk was significantly less than misclassifying the feeble-minded as normal. Not correctly identifying the permanent taint of feeble-mindedness, especially in its moronic form, would always outweigh the risk of incorrectly identifying the normal as feeble-minded. Importantly, borderlands made the latter risk less likely because they could accommodate more bodies either until they could be be classified or until a new classification could be discovered. Borderlands also reduced the risk of misclassification because once a body inhabited the borderland of feeble-mindedness, it was likely their behavior would be interpreted as non-adaptable and thus as empirical evidence of feeble-mindedness. In this way, classificatory science and the categorical spaces this science produced echoed, though with more exacting inflection, the temporal collection and detainment of lagging subjectivities within ominum gatherum settings. The moron raises the stakes of how to understand the Progressive Era theory of special education. Do more diagnostic techniques and better evaluative technologies help to identify those individuals who previously escaped classification; or do these techniques and technologies produce the empirical evidence they are measuring? This essay has been less interested in answering this constructivist question and more concerned with how education is able to use classifications as an indeterminant means of self-definition because classifications are empty of enough meaning to be made meaningful. It was because the moron classification meant something specific that it could be applied to individuals; however, it was also the case that the application of this classification required it to adapt to those individuals it classified. Education policies that continue to track students into differentiated placements designed around the empirical evidence that tracking itself produces continue to participate in the circular logic of Progressive Era special education through a fusing of education’s administrative and identificatory tendencies that enables education leaders to utilize the abstractable data of disability labels to justify seemingly race, class, and gender neutral placements. Rather than evaluating the definitions that defined the borderland space of Progressive Era special education for accuracy, this essay has used the laggard and moron as a way of conceptualizing how education defines itself. This essay has also conceptualized special education not along its borderland as questions of inclusion, free and appropriate, or least restrictive environment might do, but upon the categorical spaces education constructs and maintains through its histories and policies. These spaces are both producers of and are produced by education’s definition of itself. 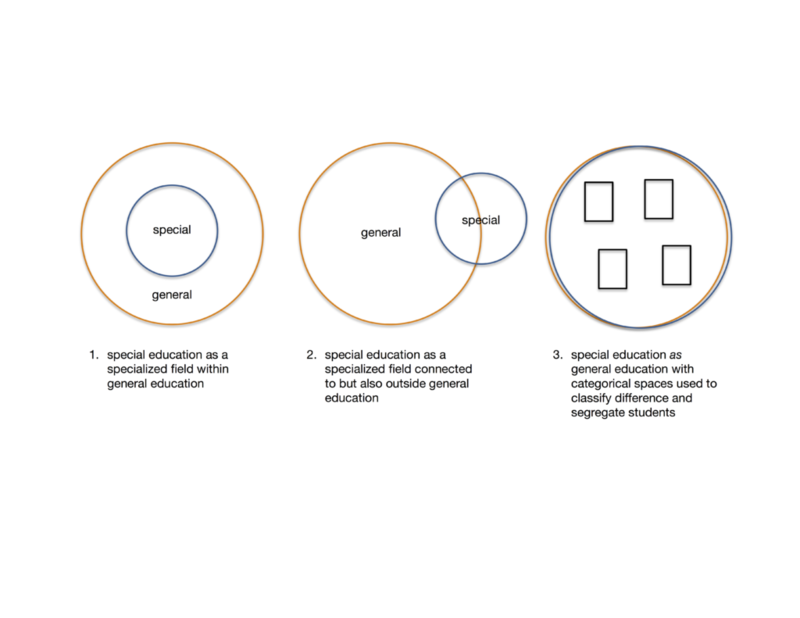 Reading Figure 1 (Part 1) and Figure 3 (above) together, the correspondence and independence images of the relationship between normality and feeble-mindedness resemble the image of special education as a specialized field within “general” education; and the overlapping and conjunction images resemble the image of special and “general” education as a Venn diagram. The former resemblance relies on special and “general” education being either non-interactive (correspondence) or on the possibility of transitioning from special to “general” education (independence). The latter resemblance relies on special and “general” education overlapping, as is the case with inclusion, or adjoining (conjunction), as is the case with students being located in separate educational institutions (i.e., custodial care). While a larger overlap may result in greater inclusion, it also produces the need to populate the resulting borderland with indeterminately defined subjectivities. Furthermore, given the fluidity of these definitions, borderlands will shrink or grow as new definitions of human difference are discovered. It is for this reason that this essay has advocated for conceptualizing special education as not distinct from “general” education because it is through this understanding that education can better discuss how it uses the categorical spaces of normality and abnormality to define itself. This self-definition is evident whenever education policies articulate human difference. It is not, therefore, only subjectivities that are defined through policies such as the Education for All Handicapped Children Act of 1975 (EHA), but education itself. While the EHA codified specific learning disability (SLD) into law, the indeterminacy of this label has allowed education to use SLD as a means of self-definition through ad hoc determinations of how well students read, write, or do math. These largely subjective determinations do not constitute tracking per se because they are non-intentional evaluations of specific, objective learning criteria. This specificity should give both education historians and policymakers pause first because it uses the circular logic of classificatory science to congeal a definition of education that includes all students by excluding certain students. Secondly, the SLD label continues to participate in the practice of evaluating intelligence (here, effectively learning to read, write, and do math) according to chronological age. What results is a definition of education made possible by the power to know subjectivities through the use of indeterminate definitions and borderlinity. This, then, was the theory of Progressive Era special education being called for by Ferrell and other experts. As argued here, this theory was there all along and was justified by a circular logic that defined education according to its administrative and identifying tendencies. For education to define itself as something other than what its classificatory schemes readily provide will require at times forgetting the incrementalism of scientific discovery in favor of remembering what these discoveries are contingent upon, a general explanation of human difference within education. Robert Osgood of St. Norbert College and Donald Warren of Indiana University served as peer reviewers for Parts 1 and 2 of this essay. Education’s Histories is grateful for their careful attention to and thoughtful feedback on this essay.